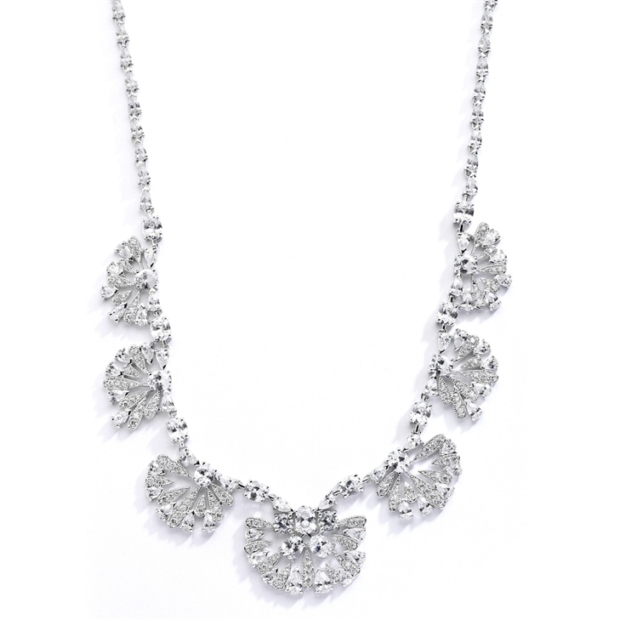 * Mariell's 16" Art Deco Cubic Zirconia Bridal Necklace has a stunning design of 7 fans with a 1" center drop. * Our genuine silver rhodium wedding necklace has Marquis CZ's fully spanning the back of the neck. * We use the safety clasp used in fine jewelry. * Your brides who adore vintage or heirloom jewelry will fall madly in love with this unique Art Deco Fan Design Cubic Zirconia Wedding Necklace. * Our magnificent piece of jewelry looks like a family heirloom and will be mistaken for priceless antique jewels. * Retailers and stockists, don't miss this piece of Art Deco beauty to add to your wholesale jewelry showcase. * This vintage "eye candy" is absolutely alluring and is sure to be a top seller among your brides who demand the very best!